Born in Birmingham, 1945. Studied Fine Art (painting) at Birmingham College of Art. Taught art and ceramics in schools and adult education centres until 1996. Lived in Oxfordshire between 1974 and 1996. Exhibited throughout this time, including at the RWA and RI. Work is in various private and local authority collections. 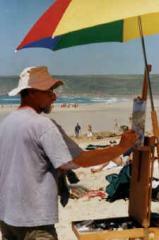 Moved to Cornwall in 1997 to paint full-time. Now lives and works in Newlyn.